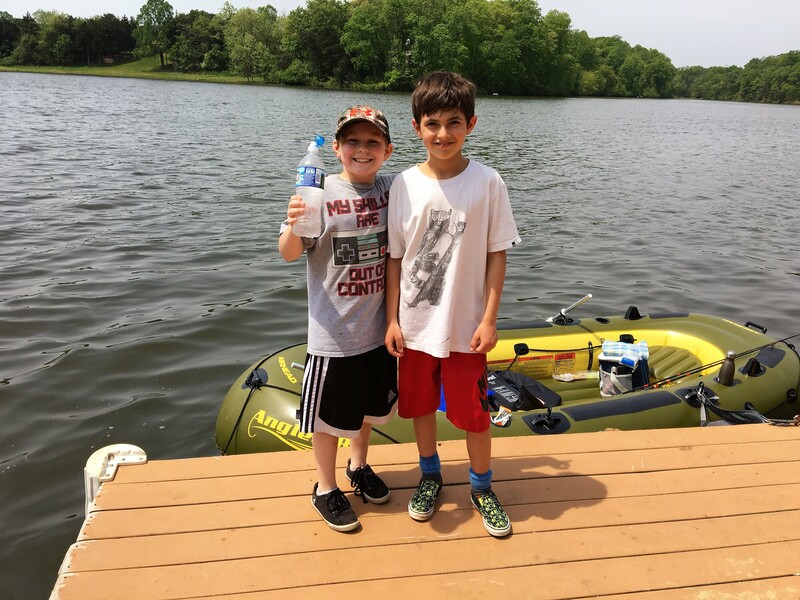 My son and his cousin were among about two dozen participants in a new free kids fishing tournament, sponsored by Fauquier County Parks, on April 29, at C.M. Crockett Park. The catch-and-release competition awarded prizes for the biggest fish and the most fish caught. The tournament started at 10 am so we arrived early at 9:15 am, but our map skills failed us and we walked the looong way around Germantown Lake to the concession stand, to the registration table, so we were last to sign up and last to hit the water, which may have contributed to our poor — read no fish — catch of the day. 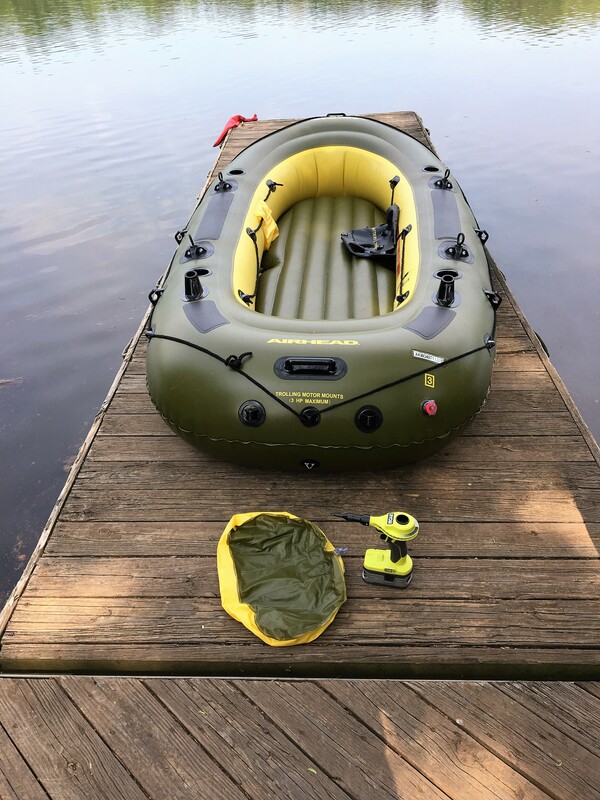 At least we had a quick start with our inflatable Airhead Angler Bay boat, which we filled up in record time with our new cordless Ryobi One + 18 V Power Inflator. This wonder tool got us from flat to full in under 10 minutes. 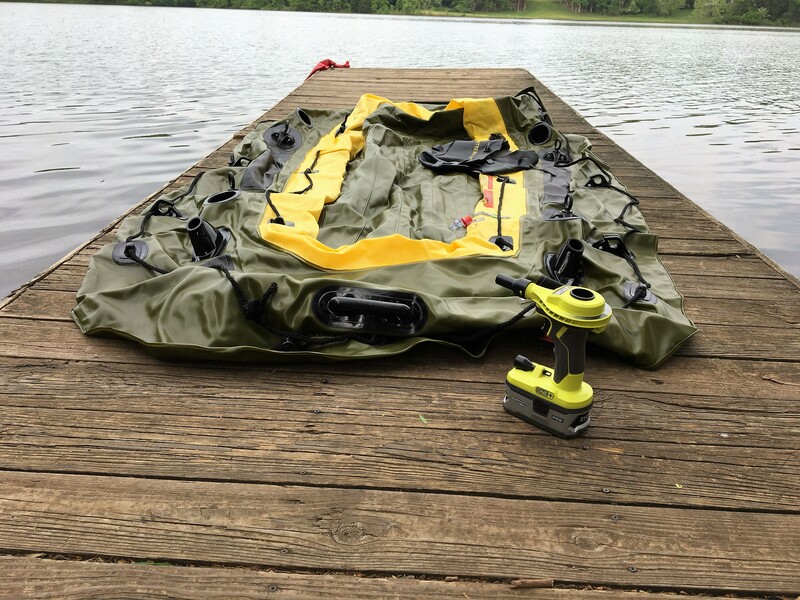 Another good word about his pump: it was much quieter than other motorized air pumps, and it was so light and portable, the size and weight of a standard drill, that I could take it out on the dock and inflate the boat, instead of having to inflate it close to my car, so that the cord could reach. Also, I was glad to not to have to use an air pump that connected to my car battery, as last time I used that type of pump my car battery went dead the next day, despite the fact it was only eight months old. The Lexus dealership proclaimed the battery was dead on arrival with a bad cell, and luckily it was under warranty, but I can’t help but think somehow the pump was responsible. Back to the tournament, we launched our boat with me as paddle power. I tried giving the boys a turn at the oars, but they couldn’t seem to coordinate dipping the paddles in at the same time and rowing them in the same direction, so we spun around and drifted for about 30 minutes, running into other angler’s lines and too close to their boats, until I took over the oars. The boys finally baited their hooks with night crawlers and dropped their lines into the water. Then as all good fisherman do, they laid back and waited. After a long 30 or 40 minutes, the boys got hungry, so we noshed on Nutella sandwiches and Goldfish, waiting for the fish to bite. When we realized it was close to the noon hour when the contest ended, I started rowing back to the concession stand, where the prizes would be announced. 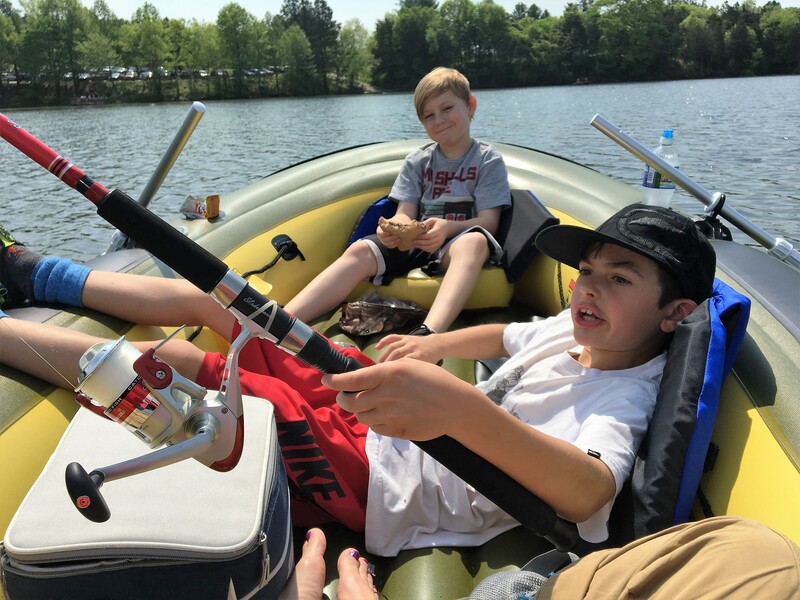 Even though we hadn’t hooked a thing, or even felt a single nibble, we wanted to see what others had reeled in. Trouble was, the wind had picked up and the current was even stronger, and we were about two football fields downstream. 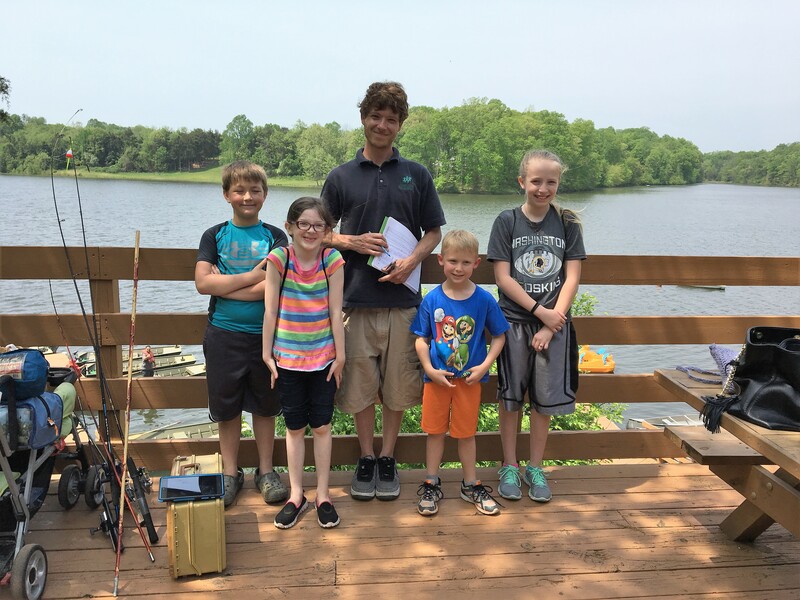 As the children and families gathered round, the ranger read out the winners, which included a tie of eight fish each for the most-fish caught honor, and a prize for the biggest fish, which measured 14.2 inches and weighed 2.5 pounds. Prizes included fishing gear and gift certificates for free future boat rentals at the park. 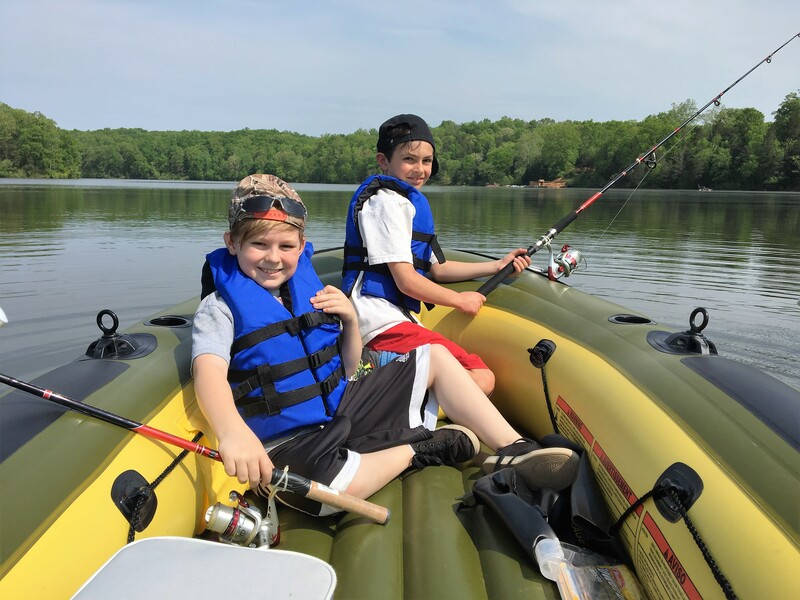 Fish or foul, the kids all had a great time, and next we are coming back with a battery-powered motor for the boat, so I can sit back and relax next time.